17th September 2009. 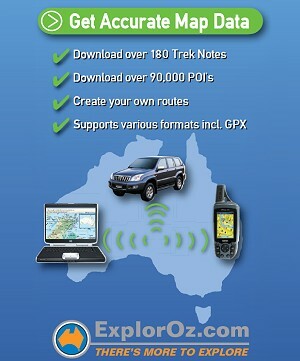 New 5th Edition Great Desert Tracks Maps, Members Photo Comp, ExplorOz website stats, How we help the industry, and Downloads. 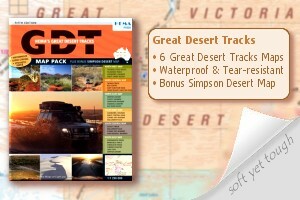 The new 5th EditionGreat Desert Tracks Maps by Hema are available now from the ExplorOz Shop so start planning your next trip with the latest information from these popular maps, which are waterproof and super strong. Also available is theGDT Map Pack, containing all six maps ( NW, NC, NE, SW, SC, SE) plus a bonusSimpson Desert Map all packaged in a hard cover folder. Also new to the shop is the iPOOd!™. The strongest, lightweight, compact camp trowel in the world. It is made from a strong and ultra-light aluminium alloy, with a collapsible carry-anywhere design, and storage for a gas lighter/toilet tissue in the handle. Now you can poo with pride! The top 3 photos selected from this popular competition have now been compiled making the first ever ExplorOz Memorabilia photo print. We are thrilled to present the final design, (view it on the About Membership page), which has been printed on canvas by Business Member Canvas Charisma and donated to ExplorOz for the purpose of auctioning at theSt George 2009 ExplorOz National Gathering. For those members not able to attend the gathering please look out for a special announcement in your Members Newsletter later today detailing how you can still place a bid to win this unique print. (Note: auction proceeds will be donated to the local community). According to Nielsen Market Intelligence, ExplorOz.com reached a record 348,634 unique visits (UBs) in August, from a total of 935,000 visits for the month. These site metrics stack up exceptionally high when compared to other websites in the industry with ExplorOz ranked No. 2 in Hitwise Australia’s 'Automotive - Recreation' category and No. 6 in Travel Destinations. We consistently rank above all Government Tourism sites and are only outranked by the mainstream travel sections of major news-media sites (Fairfax, Newslimited and NineMSN). Statistics. We are also seeing a record high number of Personal Members holding steady at between 2120 - 2130. Whilst we continue to offer all site content to non-members, Membership is the only way to gain access to the every-growing Members-only site features such as the latest map data downloads, blogs, photo gallery, discount online shopping and great Members-only activities.